It's easy to take for granted the awesome endeavours of 19th Century railway pioneers which thread us through, around or over the nation's natural barriers. It was an age of speculative adventure, built on innovation, will power and elbow grease. But many magnificent creations were abandoned during the industrial vandalism of the Fifties and Sixties. Forgotten Relics of an Enterprising Age celebrates some of them. Welcome to the Spring update of Forgotten Relics. We’re very cycle-friendly throughout this update, looking at four structures which have been rehabilitated to host shared paths in recent years. 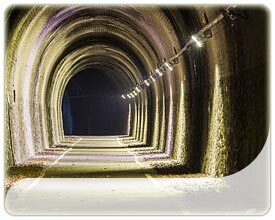 Although Tregarth Tunnel in North Wales is modest in length, it boasts a dramatic constructional history. In March 1885, five navvies were consumed by a fall of rock and brickwork following a period of heavy rain. Despite rib injuries, 35-year-old Roland Evans was able to walk back to his lodgings; however he soon succumbed to an internal haemorrhage. And two years earlier, 25-year-old Isaac Jones had both legs blown off when preparing dynamite. The excavation of St Fillans Tunnel - visited by K-Burn when it was still fenced off - frightened the local dog population but had no known fatal consequences for its miners; in fact it didn’t even need supporting timbers. 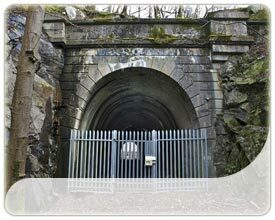 Like many structures along the Lochearnhead, St Fillans and Comrie Railway, it was built using mass concrete due to the dearth of alternative materials locally. Although stone is unquestionably more attractive, they went to considerable effort to make the concrete blend in. 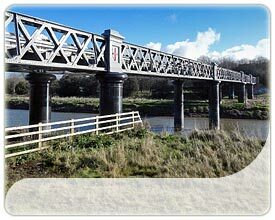 Jon Tuckett has crossed the River Taw bridge which Barnstaple Town Council felt sure would be an eyesore when it was first mooted. But Colonel Rich complimented the contractors for the manner in which the work had been undertaken when he subjected the bridge to severe testing on behalf of the Board of Trade. Three coupled engines, each weighing 40 tonnes, were left to stand over two of the piers for almost an hour with no appreciable deflection. Calder Viaduct near Castleford has definitely moved, its eastern abutment no longer being aligned with the rest of the structure. There are cracks and bulging. But masonry structures have redundancy built in and are not prone to sudden catastrophic failures; all is generally well with it thanks to a collection of tie bars and pattress plates. Tarmac has been laid across its deck as part of a scheme - not yet fully realised - to create cycle paths at both ends. If you’re not sure what an abutment is or can’t visualise a pattress plate, we have responded to the requests of many folk to publish a glossary of engineering terms. If you disagree with our definition or think we’ve missed one, please get in touch. It’s very much a work in progress. Civil engineering has its own language so we've gathered together definitions for some common terms used on Forgotten Relics. You can reach pages about these relics by clicking on their name. Across the site, new content is identified by a symbol whilst updated pages have a . The site has stories about some of our more notable railway relics, with a hike through their history and reminiscences from those who worked there. 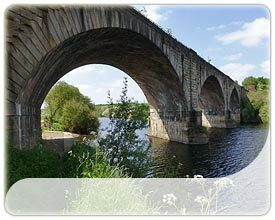 You'll also find galleries showing dozens of bridges, viaducts, tunnels, earthworks, stations and junctions. 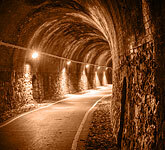 Online coverage of our disused network. Great structures spanning a gap. Destinations torn from the timetable. All the site areas are available via links in the tab bar and right hand column. We add more structures on a seaonal basis. We hope you enjoy your visit and come back to see more Forgotten Relics soon.